A historic lawsuit filed in Michigan against the state and one particular school district claims that teachers have not done their jobs. According to an article which appeared in The Christian Science Monitor, about 1000 students who are reading below grade level have filed the class action suit. Such horrible conditions of public schools attended primarily by black, brown and poor children have long existed. 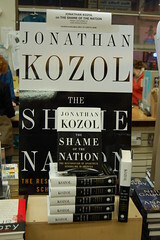 Author Jonathan Kozol‘s works have graphically described the state of America‘s public schools, calling the situation the “shame” of America. The Michigan city from which this lawsuit was filed is Highland Park, which is immediately adjacent to Detroit. I grew up not far from Highland Park. When I was young, the state of Highland Park schools and of Detroit schools was not as dire. I received a quality education in Detroit public schools. But as the economy has worsened, and, thus, has poverty, the conditions of not only Highland Park and Detroit public schools but of public schools all over the country have deteriorated. According to Kozol, legislators in many cities have argued against putting more money in poor, urban schools, and even against reducing class size, arguing that such measures would be ineffective. They are in effect saying that black, brown and poor children cannot learn…and that simply is not true. I daresay that if any child, whatever his or her ethnicity, had to sit in schools that are far too common in America’s cities, he or she would have trouble learning. Black, brown and poor children are treated as objects, not human beings, in that they are seen as not needing assistance or as being incapable of benefiting from such assistance. Meanwhile, students in more affluent areas have schools which are awarded more funds to do a quality job and boast of smaller class size. My church is operating a Children’s Defense Fund Freedom School this summer. The Children’s Defense Fund Freedom Schools Program® concentrates on improving literacy of children, especially black, brown and poor children. Class size is 10-1. Books are culturally relevant. The program uses what is called an integrated reading curriculum, designed for each grade level…and the program operates on the premise that all children, including black, brown, and poor children, are capable of learning. I hope the 1000 students of Highland Park who have filed the lawsuit win, and I hope if they win that similar lawsuits will be filed all over the country. Frederick Douglass said “power concedes nothing without a demand.” My hope is that more and more students and parents in poor urban areas, where schools are in shamefully horribly condition, will likewise make a demand on behalf of the children who have no voice. Though poor, black, and brown…they are still deserving of a quality public education. I think it’s awesome that they are fighting for their education. All children deserve at the very least adequate school conditions. There is no surprise that the children are below average. No one can do their best with substandard conditions. I wish society was more concerned with the conditions of our schools affecting our next generation of leaders than with politics, capitalism, and the rich getting richer. I visited a school today where there were NO books. That is sad. It’s criminal.